I finally have time to recap the second week of the Masterworks Festival. The week started out with rehearsals for Schumann’s 2nd Symphony and a tone poem by Sibelius (no, not Finlandia). Our conductor for the week was Daniel Meyer, who has worked with Pittsburgh, Westmoreland, Asheville, and Erie orchestras. The Sibelius tone poem was Night Ride and Sunrise. Probably not familiar to listeners, it was a great piece of work that I enjoyed playing. There was plenty of opportunities at the end to make great chords and was hymn-like in the typical Sibelius fashion. I wish there were more recordings of this piece. The other piece, Schumann’s 2nd, was quite challenging in that there were more rest to actually count than were notes. Let’s just say the performance was a bit rough (with only 4 rehearsals). One day I will conquer Schumann 2. Due to the Pops orchestra being this past weekend, the rehearsal schedule was cut short. It was a relief to be in the Pops since it is rather stress free. We performed the usuals as well as Buckaroo Holiday and Hands Across The Sea. AND it was a cool evening weather wise. 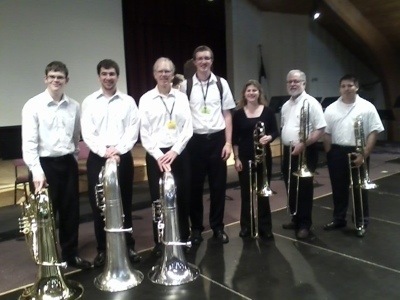 The week concluded with two performances by brass choir in the Sunday church service. It was a busy week with the audition and two concerts but well worth it. 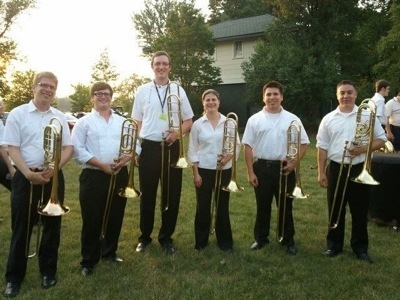 I will send a recap out next week regarding week 3’s performance of Strauss’ Death and Transfiguration. For now, time to sit through a ballet performance.